Anyway, at some point between putting the meatballs in the refrigerator and taking out the ingredients for the scones, I realized I didn’t have any heavy whipping cream (necessary for scones), or fresh basil (for the other people eating spaghetti — I don’t eat it because I’m allergic, which means I often forget to buy it). So off to the market I went. Since I had so few items, I popped into the express checkout line. Since the woman in line behind me had already loaded a bunch of items onto the conveyor belt and was practically standing on the hem of my skirt, I knew she was probably in a hurry, too. So when my purchase came to $4.35, I whipped out my debit card to make things go faster. As I turned away with my bag of groceries in hand, I heard her remark to the man checking us out, “Well, I’ve never seen anyone use a debit card for under $5.00 before!” as if that were something worth commenting on. He agreed. I didn’t turn around but just kept walking. And while I know something like that shouldn’t bug me, it kind of did. Gah. Most of that stuff wouldn’t have been true, even though it might have been snappy enough to be entertaining. I’ve been trying to stay off social media a little bit, since every time I get on there I find at least a few posts in my news feed from people whom I respect and like but who have to post every thought as if they were the first ones to think of it, or as if the angry, incendiary things they’re popping off in the depths of their own emotional maelstroms might not actually spark some negative consequences. It’s exhausting. And honestly, I get it. It’s easy to be frustrated and angry right now. It’s also exciting to have new thoughts (new to oneself, at least). Maybe this is the only way they can stand to interact with the world. And I also fully realize how ironic even this post is, because I’m essentially doing the same thing. But gah. I’m trying to find a happy medium, and it eludes me. This means I end up not posting much, because my serious writing time is going to my new book of poems (which I cannot wait to tell you more about — very soon) and my new novel (which is coming along, albeit slowly at the moment). Le sigh. If you have advice about how to handle this whole social media thing in this moment in our cultural history, I’m interested. So here’s another question for you: what is the most ridiculous thing a stranger has ever commented to or at or toward you, and what response do you wish you had given? I’m creating a safe space here for you to vent for a moment. Feel free to make us laugh, because laughter is the best medicine. To tide you over while you think about what you want to get off your chest and purge from your system, please enjoy this gorgeous self-portrait my Orange Belt Fairy Princess Badass made this week (after two classes). This is a great dinner for a chilly evening. 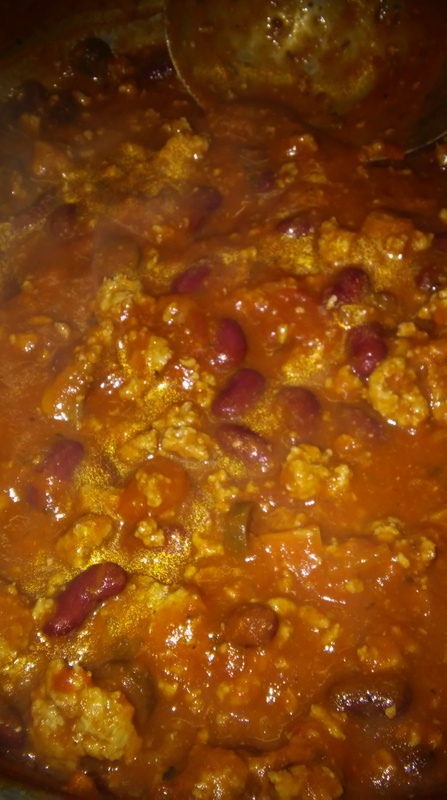 It’s very basic, and though it takes about an hour to prepare, most of that is stove time with the pressure cooker that you can use to do something else. I like to make the pot roast and use the au jus from the pot as a gravy over mashed potatoes and peas. (And to be really easy about it, use mashed potatoes from a mix and frozen peas.) Add a salad if you want and some ciabatta rolls, and yum. There’s no picture for this one because it’s just too boring to look at, despite how delicious and fall-apart tender it is. If you have the time and want to get fancy, add sliced baby bella mushrooms when you put in the sliced onion. Heat olive oil in pressure cooker and brown roast on all sides in it. Be careful not to splash or burn yourself; the oil will heat very quickly. In a small bowl, mix Ranch dip mix, mushroom gravy mix, and other herbs and spices together. Sprinkle them evenly over roast. Add beef broth and diced onion. Stir broth around so that herb mixture covering roast is moistened and diced onion pieces are in the broth. Seal the lid on the pressure cooker and cook on high heat until the pressure indicator sounds. Turn heat down to medium and cook for 45 minutes. Remove from heat and let stand for 5 minutes. Run under cold water to help release pressure before unsealing the lid. 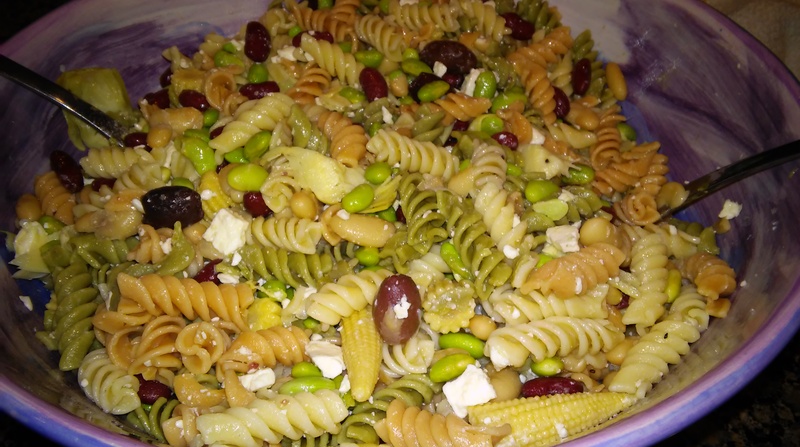 I love bacon and Ranch dressing, but I’m sort of tired of those being the driving factors in my pasta salad, so here’s something a little different with a little bit of a Mediterranean flair. It’s quite light, especially if you go easy on the homemade dressing (and if you want to swap it out for a different dressing you like better, you can). This recipe makes enough for a party, so if you aren’t throwing one, cut the recipe in half or plan to have leftovers. 1 package tri-color pasta of your choice––I like the corkscrew kind. 1 package edamame, shelled––Follow the cooking instructions on the bag. 1 can cannellini beans, drained––You can substitute garbanzo beans (chick peas) if you like. extra virgin olive oil––Make sure you go with a brand that tastes good! Boil the water for the pasta for a dollop of olive oil instead of salt. Follow the instructions on the pasta. Follow the instructions on the edamame to steam them. Drain and rinse the canned/jarred ingredients. Mix all the yummies together in a large bowl. Now for the dressing, which is a Lebanese dressing my grandmother and mom taught me, and which I use for many kinds of salad. Add the garlic salt and lemon pepper to taste. I usually cover the entire bowl with each spice because it will be mixed in with a lot of pasta salad. (You can be more generous with the lemon pepper; if you add too much salt the flavor won’t feel light or refreshing.) Add enough olive oil to coat everything slightly but not enough for the oil to collect at the bottom of the bowl. Add a generous dollop of lemon juice. Mix everything together. 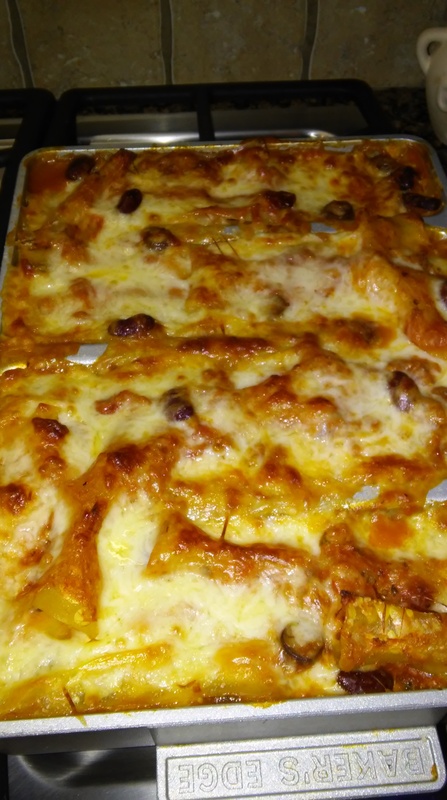 The title of this recipe post might be a little misleading, because the lasagna I’m about to share with you does contain meat, though you could leave it out if you wanted. This is a wonderful one-dish meal for families whose members include finicky kids who won’t eat vegetables. It has fiber, veggies, dairy, and meat all in one. It also goes nicely, if you’re feeding a hungry bunch, with ciabatta rolls or garlic bread. Add a salad and you have a delicious weeknight feast. But be forewarned: a serving of this stuffed lasagna can be really filling! Preheat oven to 350 degrees (Fahrenheit). Spread a thin layer of meat sauce on the bottom of the lasagna pan. Spread a layer of noodles on top of this. Spoon some of the ricotta mixture over the noodles. Add a layer of meat sauce to cover the ricotta mixture. Sprinkle the shredded cheese blend over the whole thing. Spread another layer of noodles on this, then repeat the ricotta, meat sauce, and shredded cheese steps. Do it all one more time if you have room in the pan. Keep going until you’ve filled the pan about ¾ of the way to the top. Add one last layer of noodles, then the remaining sauce, and finally the remaining shredded cheese. Sprinkle the parmesan cheese blend over the whole thing. Cover with foil and bake 30 minutes. Remove the foil and bake another 10-15 minutes or until bubbling. Let the lasagna rest five minutes before cutting into it and serving. The deliciousness is resting before we dig in! 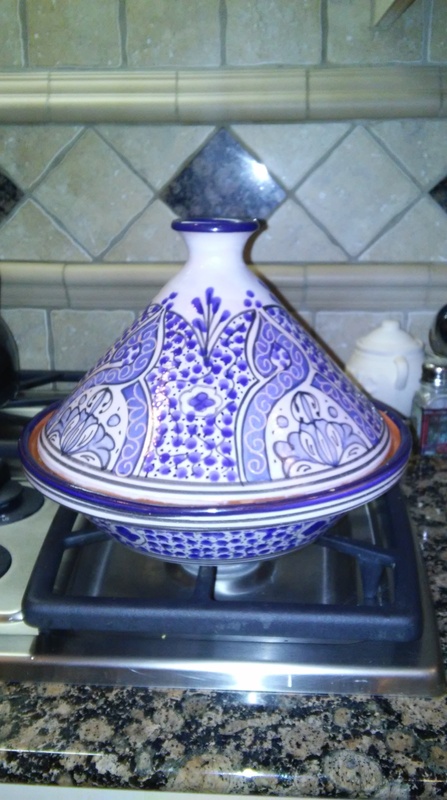 For the uninitiated: a tagine is a Moroccan-style stew; it’s also the vessel said stew is cooked in. A tagine can be a one-pot meal, containing most of your food groups in a single, easy-to-prepare dish. Served over couscous or rice, it makes an easy but comfortably complex dining experience, excellent for all weathers. If you really want to be balanced, add a salad or green vegetable on the side. So the other night I needed to make dinner and didn’t have anything planned, but I did have a few simple ingredients on hand in the pantry (including canned vegetables, which means this was super easy to put together, though fresh ones will work beautifully too if you have the time). 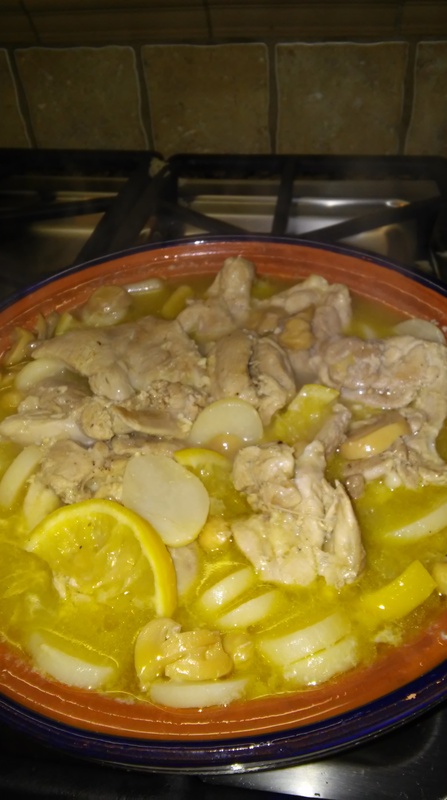 I made what I’m calling a Lemon Chicken Tagine. It ended up being delicious served over jasmine rice. Here’s the recipe. In a large pan (not your tagine yet), sautée the garlic and mushrooms in enough olive oil to cover the bottom of the pan. Add butter to taste; I usually drop in a good-sized spoonful scooped from the spreadable butter or a tablespoon of stick butter. Add the chicken thighs, chick peas, and potato slices. Now is a good time to add a little salt and pepper, if you like, to taste. Cook until the chicken is done (internal temperature of 165 degrees Fahrenheit), turning the thighs now and then and stirring the vegetables around. When this is finished, transfer everything to the tagine. Add garlic salt and lemon pepper to taste. Spread the lemon slices around evenly. Add water to the dish just until everything is mostly covered, then stir everything up to make sure it’s well mixed. Stir gently, though: this dish will be full! Sort of a monochromatic meal, I admit, but the whole thing took less than 45 minutes to conceive of and prepare, and even my finicky-as-all-get-out children ate it and liked it, so I’m calling it a success! I served it over jasmine rice, and we even had enough leftovers for one hungry person to heat up for lunch or dinner. Like I said before, there are all manner of tagine cookbooks out there. I even have a really good one. The thing is, a lot of the recipes in it don’t really work for my family most of the time. There’s always at least one ingredient that someone hates or is allergic to or that is impossible to find at the grocery store around the corner. Mostly what I’ve found is that these recipes are adaptable. Pick one that gets it mostly right for you and then pick and choose from the ingredients list as you see fit. Make substitutions with similar foods. Play around with it. Enjoy! 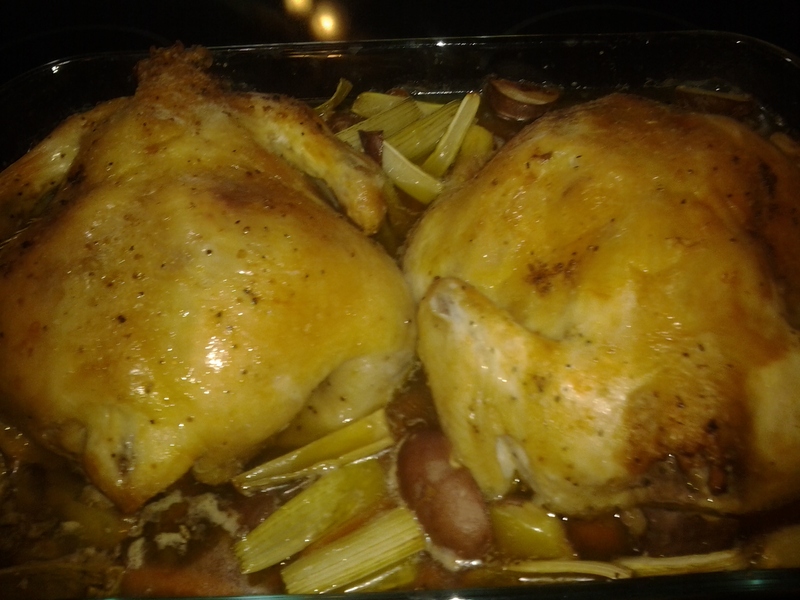 In response to Sarah Warburton’s blog posts this week about her family trying to eat more “food-shaped food” (as opposed to processed foods that come in boxes), I wanted to share my favorite roast chicken recipe. It takes a minimal amount of prep work and practically cooks itself, and it’s healthy as well as being delicious. In fact, once I learned how to dry-brine a chicken, it became my default way of preparing whole poultry, because it makes the bird so flavorful and juicy and tender. No more dry chicken! When we make this recipe, we use two whole birds because Tiny Beowulf can eat half a chicken on his own when he’s hungry. (I wish I were exaggerating, but he’s seven and already bigger than his nine-year-old sister, who’s of at least average height. I’m not hugely tall, but I’m also not completely short, and he comes up to my chin.) But my point is that you can modify the recipe for one chicken. You can also reduce the amount of salt you use for dry-brining, if you wish, especially if you’re seasoning the poultry the day you cook it. You will find the way to your own tastes. 1. Combine the salt, lemon pepper, and garlic salt in a small bowl. 3. When you’re ready to cook the chickens, pour a shallow bath of chicken broth into the bottom of the baking dish. Toss in the carrots, potatoes, onion, and celery around and under the chickens. Brush olive oil over the tops of the chickens; coat them well. 4. I use a convection oven, but you can do this in a regular oven, too. Roast or bake at 450 degrees for 15 minutes, uncovered. Then roast or bake at 450 degrees for 30 minutes, covered with a loose aluminum foil tent. 5. Reduce heat to 375 degrees and continue to bake, loosely tented, until thigh meat (not next to the bone) reaches internal temperature of 165 degrees at least. In my convection oven, this usually takes about another hour to an hour-and-a-half when I’m cooking two chickens, but I recommend you start with 30 or 45 minutes and then just keep checking the temperature and adding on another 10-15 minutes each time as needed. After the first 30-45 minutes, remove the foil so the skin will gently brown and get crispy. Roasting or baking just one chicken may reduce your cooking times. The main goal is to make sure the bird’s internal temperature is safe. I’m not a food photographer by any stretch of the imagination. Trust me, it’s delicious. 6. Once the birds are out of the oven, let them rest for about five minutes before cutting them up. Serve with the root veggies and a lovely long grain and wild rice or ciabatta bread with butter. If you choose to roast just the chickens without the vegetables, serve with a salad, too. If you make this recipe or have other tips or comments to share about dry-brining poultry or cooking chicken and vegetables, please post in the comments section below! I do not watch the Super Bowl. Even though I live in Texas, I admit I don’t really care for football, not any part of it, and so I don’t host or attend Super Bowl parties as a general rule. I don’t watch the game, not even for the commercials (though I have been to quite a few SB parties in the past which were primarily devoted to watching the commercials).